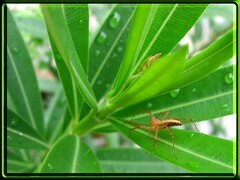 Lynx Spiders and others roaming our small paradise! Yay! 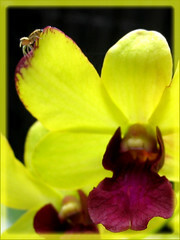 Tiny little spiders that have taken residence in our tropical garden paradise. They’re seen very frequently mooching around our plants. 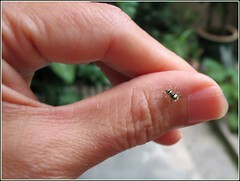 Look what I’ve found….a pretty stripy spider with long spiny legs. Did a google search and I’m so delighted to have identified them – Lynx Spiders! Lynx spiders are hunting spiders, predators of insects and hunt without a web. 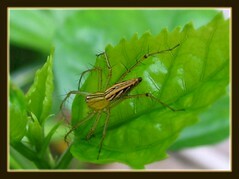 Long-legged, they can run very fast and jump on their prey like a cat, hence commonly known as Lynx spiders. They are usually found on grass, plants, flowers and shrubs, actively seen during the day stalking their prey. They have eight eyes, with six of them arranged in a hexagon-like pattern, a typical characteristic of members of the family Oxyopidae. 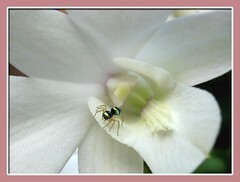 Read more at this site: Spiders of Australia.